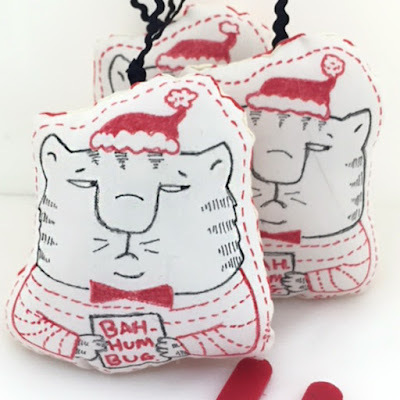 Smirking Goddess™ Review: My Witty Cat Christmas Ornaments Now in my Etsy Shop! My Witty Cat Christmas Ornaments Now in my Etsy Shop! I like the idea of transforming something old into something new, so I upcycled some kitchen curtain material into three hand-drawn whimsical cat ornaments. My disgruntled hand-drawn kitty was conceptualize and created using permanent, archival pens, stuffed, sewn with a rick-rack hanger. The buyer can write their name and that of the giftee even if it's for themselves! Hope you will explore my shop this holiday season as I add more fun art decor for your home.